In 2010 Indonesia applied new regulations regarding which nationalities have to apply for visas, and who can get visas upon arrival. For twelve nationalities these are issued at no charge: twenty-one other nationalities have to pay for the visa on arrival. This is apparently based on immigration requirements for Indonesians entering those countries. The following twelve countries or territories receive a 30 day no-charge visa upon arrival: Thailand, Malaysia, Vietnam, Singapore, Brunei, Philippines, Hong Kong, Macau, Chile, Peru, Equador	and Morocco. Citizens of the following sixty-two countries are now required to pay for a visa upon arrival - USD 10 for a 3 day visa, or USD 25 for a 30 day visa: Algeria, Argentina, Australia, Austria, Bahrain, Belgium, Brazil, Bulgaria, Cambodia, Canada, China, Cyprus, Czech Republic, Denmark, Egypt, Estonia, Fiji, Finland, France, Germany, Greece, Hungary, Iceland, India, Iran, Ireland, Italy, Japan, Kuwait, Laos, Latvia, Libya, Liechtenstein, Lithuania, Luxembourg, Maldives, Malta, Mexico, Monaco, Netherlands, New Zealand, Norway, Oman, Panama, Poland, Portugal, Qatar, Republic of Korea, Romania, Russia, Saudi Arabia, Slovakia, Slovenia, South Africa, Spain, Suriname, Sweden, Switzerland, Taiwan, Timor Leste, Tunisia, Turkey UAE, UK and the USA. Nationalities not on either of the above lists, and people who want to stay in Indonesia for longer than 30 days, must get a visa from an overseas Indonesian Embassy or Consulate before arriving. You can extend your visa whilst in Indonesia. A travel agent will do this for you for a fees. It takes 3 days and you will need to give them your passport and a copy of your plane tickets. Your passport must be valid for at least 6 months after your stay in Indonesia, and you must have an onward ticket. Methods of payment: USD cash (as with all the US dollars you bring to Indonesia, these need to be in pristine condition and produced in 1997 or later), Mastercard and Visa. 220 volts. Try to buy a plug adaptor before coming to Indonesia. Indonesian Rupiah. In Bali you can change all hard currencies in the south: it is not easy elsewhere in Bali. Banks and moneychangers will only accept post-1997 US$ bills in pristine condition. Mastercard and Visa are widely accepted in south Bali and in all upmarket hotels and shops. Some places take AmEx and Diners. You may encounter a 3% surcharge for credit card use. Indonesia has three time zones, Bali is GMT +8hrs. Not part of the Indonesian culture, but - although it is still not expected - now quite commonplace in the tourist areas. Most medium to high priced restaurants have a 10% service charge, which is theoretically distributed to all staff - and then 10% government tax, so a total 21% increase. A good rule would be to only tip when you�ve had exceptional service and then whatever feels appropriate. Indonesian people adore children - nowhere will your children be unwelcome, in fact - in places - the attention they receive may be slightly overwhelming for your children. Watch your children on the beaches, there are some strong undertows. In Bali, English and Japanese are widely spoken in the south of the island; even in rural villages some English is spoken. March through to October is the dry season with some of the best diving in Bali and Manado. Heavy rainfall in December and January ruin visibility. The Balinese, while modestly dressed themselves, are very forgiving people when it comes to tourists� attire. However walking around in Speedos or a bikini is not really appreciated. When entering temples you are required to wear a sarong and a sash, you�ll see that the temples themselves are similarly attired. If you have to visit a government office, long sleeves and long pants/skirt and shoes are advisable. Pack light, natural fabrics - and pack light, there are cheap clothing shops all over. Bali�s chamber is at Sanglah Hospital in Denpasar. Much of the information on this page was provided by by Annabel Thomas of AquaMarine Diving. A comprehensive travel tips section gives plenty of practical information. Full colour maps and great photos. 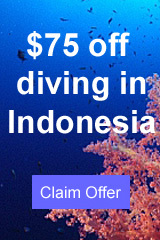 Please send us your comments on diving or travelling in Indonesia, or anything else on this site. Either fill in the form below or see our more detailed recommendations form.